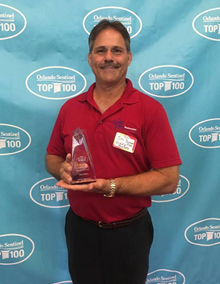 August 17, 2018 – QFB Property Restoration, a member company of DKI, North America’s largest disaster restoration contracting organization, proudly announced it was selected as one of the 2018 Orlando Sentinel Top 100 Companies. This is the fourth consecutive year QFB has earned this recognition. The Top 100 Companies, produced by the Orlando Sentinel in partnership with Best Companies Group, identifies and honors the best places to work in Central Florida. To be eligible, companies must meet certain qualifications, such as location, number of employees and number of years in business. Each nominated company is ranked by evaluating workplace policies, practices, systems, demographics, and the employee experience. In an effort to recognize all list-making companies, an awards luncheon was held on Friday August 10, 2018 from 11:00 a.m. to 2:00 p.m. at the Gaylord Palms Resort and Convention Center in Orlando. The complete Top 100 companies and their rankings were published for the public on August 12, 2018. Founded in 1992, QFB is one of the largest restoration companies in Central Florida, serving Orange, Osceola and Seminole counties. Their licensed, certified and insured experts can handle every aspect of property damage restoration from emergency water extraction or board-up to structural repairs, mold remediation and even assisting with the insurance claim process. With over 24 years of experience in commercial and residential restoration, their customers can expect their utmost attention and quality workmanship. Please call 888-385-1527 or visit www.qfbrestoration.com to learn more. « When Was The Last Time You Completed These Fire Prevention Tasks?